Dynaudio M3 is the ultimate main monitoring solution, combining world-class driver and cabinet technology from Dynaudio with cutting-edge signal processing and amplification from Lab.gruppen and Lake. 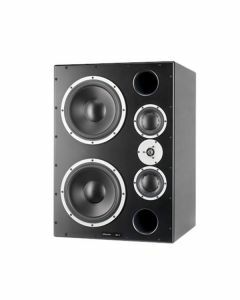 The Dynaudio Professional M3XE monitor system that takes monitoring to a whole new level with a significant upgrade from its predecessor - the renowned M3A 3-way monitor. Each speaker is powered by a four channel PLM 12k44 amplifier from Lab.gruppen. With the newest and most pristine Dynaudio ESOTAR driver technology, M3XE takes over where most other monitor systems give up. With unsurpassed attention to detail, underpinned by an impressive 22Hz - 21kHz frequency response and beyond 135dB SPL, M3XE leaves no room for desire in terms of resolution, range or sheer power. Different from its sister monitor M3VE, a set of M3XE's is powered by not one, but two 12k44 Lab.gruppen amplifiers, using the integrated Lake active cross-over processing as well as powering the HF, MF and dual LF woofers by the four independent amplifier channels of the 12k44. Please visit http://labgruppen.com/series/plm-series for more info. In short, M3XE surpasses any and all main monitor expectations!